"I don't want us to get into any more impossible situations." The continuing efforts of Home Vision to release the entire body of work of Ismail Merchant and James Ivory to DVD brings us this handsome motion picture, as the Merchant-Ivory team, with a few Indian and Henry James pictures already to their credit, hadn't yet begun their efforts on what may be their most successful and certainly their most popular productions, based on the novels of E.M. Forester. 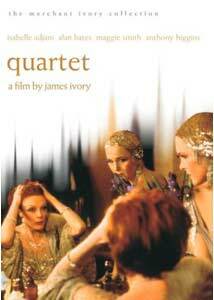 In Quartet the author of the source material is Jean Rhys, whose sensibility doesn't seem to square quite as well with Merchant and Ivory as James or Forester; but this is the Paris of the 1920s, and it's full of tempestuous emotions and betrayals, sumptuous costumes and production design, and a cast of the first caliber. Maggie Smith and Alan Bates play the Heidlers, a British couple living in Paris; Lois and H.J. are just the right sort of people, and Marya, played by Isabelle Adjani, is not. H.J. refers to her routinely as "the silly girl," and only slightly more charitably later as "the crushed-petal type"; she may not be a figure of pity, but she is in need of help. Her husband, Stephan, a Polish black-market art dealer, is hauled off to prison, the couple's hotel rooms ransacked; with no hope of his release and little or no cash on hand, Marya's situation borders on the desperate. Lois and H.J. swoop in, offering her their spare bedroom; there's more than an intimation that they've played the good Samaritans before, and that it hasn't always gone swimmingly. Inviting Isabelle Adjani into your home, especially when you've got a husband with an obviously wandering eye, cannot come to any good. Marya is loyal to her husband in prison, but that doesn't stop her from letting the Heidlers pay the bill at tony Parisian nightclubs featuring le jazz hot, and flirting with the most attractive and interested men; this makes H.J. wildly jealous, which in turn does the same to Lois. The psychological heart of the matter is in how these resentments and attractions play themselves out among the central characters, and if it's emotionally not the most nuanced stuff, Rhys couldn't have asked for better interpreters. Ruth Prawer Jhabvala, the longtime Merchant-Ivory screenwriter of choice, has written a script that is another model of clarity; it's elevated by the cast as well. Adjani is lovely and heartbreaking; Bates saves H.J. from being little more than a lecherous, pompous old fool; and Smith, as always, is quietly devastating. In many ways this film is most interesting to us not necessarily on its own, but as part of this elegantly produced Merchant Ivory Collection—in some respects, you can see parts of this movie as a sketchbook or a dry run for themes you'll find in the team's later work, especially A Room with a View and The Remains of the Day. That's not to suggest that it isn't worth watching on its own terms, but when you've produced films as accomplished and elegant as A Room with a View, your other work inevitably will suffer by comparison. Image Transfer Review: The colors seem to be a little dulled down, looking as if the print has faded considerably since the film's original theatrical release; but the transfer to DVD is nicely done, without any visual interference. Audio Transfer Review: There are balance problems on this mono track, in the low registers especially. In many scenes, Bates' voice doesn't rise above a whisper, and you'll be hard pressed to understand what he's saying without turning on the subtitles. Extras Review: The only notable extra is a conversation (11m:22s) with Merchant, Ivory and Jhabvala, discussing the origin of the project, its casting, and anecdotes about location shooting. A moody, stylish, well-crafted picture from James Ivory, Ismail Merchant, and Ruth Prawer Jhabvala. It may not be on the same tier as some of their other films, but it's a thoroughly professional effort.